location; her canoe trips and travels provide her with a variety of subjects. Jane Graham passed away in 2005. Enjoy her images in memory of her. This garden scene captures a summer yard and stone house during late afternoon when the light is dappled. The painting evokes feelings of tranquility; the garden is a haven. 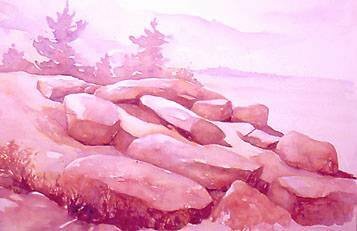 "TUMBLING BLOCK ROCKS I -KILLBEAR"
The huge rocks with their intense reds and ochres, have a precarious quality. They seem alive, ready to tumble into the bay. 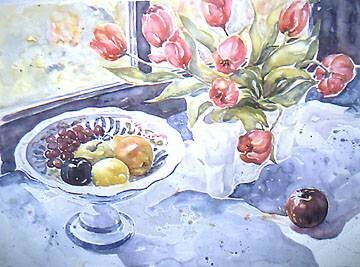 This still life celebrates rich color, the rhythm of shapes, the play of light and shadow. The objects are mundane but have a precious quality. 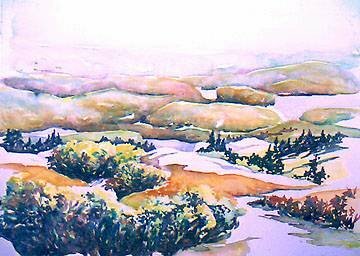 "PANORAMA II - LA CLOCHE, KILLARNEY"
The view from Silver Peak, the highest peak in the white La Cloche Hills of Killarney Provincial Park, is dramatic due to the quartz rocks.